CTF (Computer To Film) inkjet image on film: If you insist using film to make plate to be in accordance with the traditional way, then this computer to film system should be the choice. Because of the current inkjet printer / film / ink / RIP software, has a substantial improvement than 2 or 3 years ago. If you want to make a 175 lines 1% dot of the light / dark image is now simple and easy. And if that 175 lines film is good for multi-color printing then that some of the printing length of the size needs to be very accurate jobs will be out of problem. The dimension accuracy can be up to 1/10000 (0.1mm per meter) precision. Even the photosensitive film in the final drying process after high temperature results are the same, not have to say, through the lens image distortion and error deformation. RIP software, in fact, is the soul of CTF film production, in addition to the above-mentioned various printer precision, dimensional stability, the density of black area, with a variety of options, etc. are actually given by the RIP. NozzleBlack RIP is the only software that uses Macintosh system to control inkjet printers. It is a software that has been written by a number of operators who have experienced more than 20 years in color separation and screening field. As long as they are satisfied, you can ensure that the quality of our CTF film and photographic film is no difference. NozzelBlack printer + film + ink + RIP is the only choice for making 175 lines 1%. Inkjet CTF film over the years due to improvements of both hardware / software manufacturers as well as engineers’ efforts and working closely together, it is still hard to replace the using of photographic film, why? For those who have made film by inkjet printer in recent years, why give up on the halfway, or still not satisfied with its results for plate making? (Can’t be compared with the photographic film). purpose to satisfy with the film can replace photo film? but why still can’t achieve the result as good as photographic film? print 175 lpi 1% dot. In addition to stepping, we have also installed a special device, so that the inkjet during printing process is more robust, which is why it will not see the traces of the Y-axis step line after printing, this is important for a fine flat screen area. So that you can achieve 175 lpi 1% dot reproduction easily, meantime also play a performance to the extreme of a modern inkjet printer. RIP is very important ! Needing an accurate dimension stable for big format inkjet film ? RIP is important ! Tolerance of inkjet film seems a big problem by which everybody will presume it is because of hardware (inkjet printer) with mechanical defects of roller stepping / slip preventing as well as surface coating of film, it is not easy to solve these problems. at the beginning of RIP design, engineers worked with past practical experience in color separation and screening, who know well about the differences and important factors for inkjet user’s demands. High temperature occurred during photosensitive film exposure and drying after development is facing the same problem. Without tolerance problem, 175 lpi 1% fine reproduction will means something, it is nice to have this goes back to RIP design. NozzleBlack RIP created by a group of engineers who have at least 20 years of practical experience in color separation and screening they know what are the differences and important factors for an inkjet film user from the beginning when they organize the software in addition to the fine do reproduction and sharp image. *Why NozzleBlack - RIP ? can be done easily in the RIP for any curves. Although CTP (Computer To Plate making) is widely used in offset printing industry for years, but it is not all of the offset printers are using this CTP system. Conventional offset printing machine still needs to make positive film first for PS plate image exposure. How can these conventional offset printers are able to enjoy this new digital inkjet technology for their plate making especially when photo film is facing termination and price of it is getting higher and higher day by day due to fewer and fewer photographic film manufacturer in the market. By using photo film, the expensive investment of equipment such as image setter, film processor are too huge a sum for them to put in, though second hand CTP machine retired from offset is cheaper but it is facing another problem: termination of production and discontinuing supply of parts ... which means not only no more hardware maintenance but also any after service is available. This will be a nightmare for all existing photo film users which they have to face in near future before it is too late. Fortunately, due to new technology of inkjet nozzle development with improved RIP software for fine dot reproduction the inkjet film making is ripe and mature for the industry now. Users only have to do more adjustment of their mind that black image is no longer to be made by photographic film any more. No more developer, no more fixer (no chemicals) with no expensive investments for equipment as well as maintenance and electric power consumption, most important advantage is that due to use of no chemical it is very green and friendly to our environment. There is an offset printing factory YF in Tainan which is in the south part of Taiwan, they relied on outsourcing of film to make PS plate for their Roland 200 / Roland 700 and Komori S40 printing machine. Now they are using NozzleBlack inkjet printer making their own film with NozzleBlack PS-RIP software since beginning of 2014, doing wonderful jobs in big size (and the size is accurate in registration) at very low cost for their routine works, the boss is very happy with this inkjet film making system. This big size printer operate with NozzleBlack PS-RIP special and fine image forming technology can accept HQ-RIP with 1 bit TIFF signal through ink drop control from Adobe in order to distribute ink accurately on film in accordance with the size directly. The size can be from A4 to 1118mm in width and limitless in length. printer / RIP / ink / film always happen different problem and separately, there seems no one is integrated all together in a package. When Mr. & Mrs. Su are enjoying the quality negative as good as photo film with high opaque black density made by them self, meantime they are also enjoy the wonderful after sales service from the printer dealer for they are using all the materials certificated by the manufacturer. Now they do not have to worry about printer out of order or break down at all. WG co. is a color label printer especially for electronic field which is a most quality demanding printing job of 175 lpi and 1% reproduction in label industry, due to heavy investment of a digital CTP equipment and peripheral machine, they do not want to invest so much. RIP of NozzleBlack is created by a group of engineers who have at least 20 years of practical experience of color separation and screening who knows what are the difference and important points for an inkjet film user from the beginning when they organize the software in addition to the fine dot reproduction and sharp image. The boss Mr. Tsen is very happy with the results of negative made by inkjet printer now. 1. Fine image and small dot could not be reproduced precisely so that still could not be used as good as photographic film and substitute it. The inkjet film quality have to be improved and to be accepted at least as good as a film from image setter otherwise it will be no potential at all. 2. As mentioned the black density is enough for exposure, but the problem is that about 50% of the exposure UV was absorbed by the prima coated on the film in order to receive black ink well, therefore they have to prolong the exposure time 2 or 3 times than photo film but still failed sometimes for the fine image areas. At the beginning of 2014, Korean dealers visited us for the purpose of improving their inkjet film quality for more black density and pursuit finer reproduction up to 175 lpi 1% dot for the highlight area of label printing. Now even flexible packaging flexo and gravure printers start to use our RIP-PS and consumables. Many people in Japan use PX-H9000 PX-H7000 and PX-H6550 printer with RIP capable for color separation and screening with 100% single black ink cartridge, the opaque density is acceptable but find the font is changed especially when the character is small and critical, changes in height and thickness of font happen in big character as for corrugated printing maybe not a problem but could not be accepted by photo film users for it was never happened before. Dealers in Japan is very eager to find a good RIP for this purpose in order to be able to print 175 lpi 1% dot reproduction with unchanged font and stability in big sized film. In Osaka area, there is an user they measure length of every inkjet film by using the scale on the width of the printer to check for the accuracy then make plate. This is proving that both multi-color registration and size stability is as good as photo film. The cost of inkjet film making can save you about USD 7.00 - 8.00 per square meter (total inkjet film cost is 50-60% of photo film), say if you make 12 m2 film everyday it will save you USD 25,000.- in a year, thus you will have the printer investment returned in half a year. In addition to the PS plate making, multiple usages such as photopolymer / hot stamping / flexo / vanish / embossing and screen printing all after print converting jobs can be also applied. At the end of 2014 YF company has invested a 2nd system for the growing demands. This is proving that inkjet film making is satisfactory and the era of digital film making by inkjet is really opening. 1. 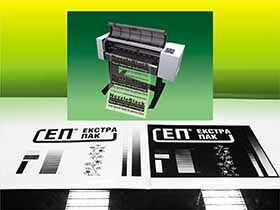 How is CTF-175 inkjet film system created? Since LaserBlack enhance has been created by Flexo Technology Inc. in 2006, we have about 20000 units used all over the world satisfactorily, some of the users are requesting for a new method to make bigger size negative film with fine resolution and good enough black density for their plate making. After it, there are so many CTF system to print on film in the market with special ink and special treated film as negative film. It is however, in many cases if the density is good the resolution can’t be so fine, if resolution is good the opaque density is not enough for plate making i.e. not reliable and stable. @flexo RD team was thinking more than that: a new technology can inkjet fine resolution up to 175 lpi 1% with black density up to 3.50 and most important is always stable for production in order for colorful label, offset, flexo and gravure printing. 2. What are the advantages to use NozzleBlack CTF-175 inkjet printer? a. Do not have to use photo-film any more so as to save the developing equipment. b. Get your film by one click only, no more engineer is required. Anybody can make it. 3. How is the resolution and density from a NozzleBlack CTF-175 inkjet printer? The black image printed of negative area is dry up immediately with heater after print which will never fade away and disappear. By using our double-side coated film it is not fade away or spread and will not melt with water. 5. Shall we use special ink for CTF inkjet printer? Yes, our NozzleBlack ink is a super-black nano ink with a very thin layer to reduce the cost of ink consumption but still keep a high black opaque density to block the UV light during exposure. 6. How about ink consumption and print speed of a NozzleBlack CTF inkjet printer? Print speed is 1 – 3 m2 per hour i.e. 20 - 60 min. per m2 depends on the model and RIP settings. Color separation and screening jobs can be done by our RIP software. Fine screen dot can be done up to 175 lines per inch which is good enough for any kind of plate making for printing. Depends on software, our RIP PS can make small dot up to 175 lpi 3 % ,while by using our RIP SS can reproduce 175 lpi 1% finest dot for the small appearance of high light areas for color label printing by letterpress printing press from which the result is like printed by a digital plate. Skilled engineers are not required any more for color separation / dot shape / ruling and angle all can be set by RIP software from the computer. 8. What kind of computer shall we use for this system? Both of these two RIPs are operated by Mac computer which has been proofed in half a century showing the reliability and stability in prepress room already. 9. Any toxic or hazardous chemical used on the ink. We use water based ink which is environmentally green and friendly, non-toxic and not harmful to human. 11. Where can we buy the ink and film? Any shipping problem? Our double-side coated film is also available from us or from your dealer without shipping problem with film and ink for you at all. Please note. Other ink is not recommended for your printer to prevent block and damage of nozzle head. No, you can not use any other ink for the channel and nozzle head make be blocked and damaged easy. Yes, after print there is a heater for drying up the ink quickly to prevent ink spread in order to keep fine image and dot area clean and clear so as to dry up the image completely. 14. Can we use any other film to print? Using any other film may cause problems as not good in registration or not stable during image printing. 15. What plate making can use CTF-175 inkjet film? No matter it is a positive or negative film, our CTF film can be used for color label printing especially for the reproduction of high light small dot area, offset, letterpress, flexo and gravure all kinds of printing for good result as a film from an image setter. 16. Shall we adjust CTF-175 inkjet printer frequently? As mentioned the CTF printer will clean the nozzle head frequently and automatically once you have set up the conditions and running smooth according to your production, it is not necessary to readjust the printer at all. 17. Any tips to print film quickly for my plate making? B. Plug in power all the time CTF printer will clean frequently and automatically, which will keep the head in best condition to print. C. Paying more attention to ink cartridge to see if it is enough to do your daily job for mass production. 18. How about ink consumption. Ink consumption of our CTF is 10-20 ml per m2 printing depends on the black area of image to print. In case of any more question, please do not hesitate to let us know. We will be happy to answer all the questions for you.